Winchester Geese is how prostitutes were known in the middle ages when the Bishop of Winchester ran licensed houses of 'geese'. An area in Southwark became the burial ground for these women. Later a burial ground for those with cholera, smallpox and similar diseases. By Victorian times it was an overcrowded burial ground for paupers, finally closing in 1853. 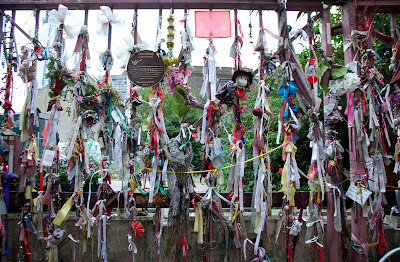 In recent years this shrine on the gate has appeared to remember all those who lie here. I rather like the way impromptu shrines develop. I've never heard of Winchester Geese. Learn a little every day; Winchester Geese. That's a wee bit creepy. I have never heard the expression before. I love learning new things. The shrine has an interesting look to it with all those bits of fabric and ribbon. That is a new piece of information I have learned today. Sad to read the comment saying it is under threat of redevelopment! Glad they are still being remembered! I hope you added to this 'instalation' - I think it is wonderful!! Ther has to be so many stories here. I've never heard of this and I thought I knew my Middle Ages history! Fascinating! A lovely way to pay tribute to all the people who are buried there. Hopefully a good fuss will be kickedup if they really do move forward with plans to build over the cemetary!